Here’s a fusion of two dishes from my two favorite ethnic cuisines: Japanese and Indonesian. It takes the best of Japan’s buta-no-kakuni (braised pork belly) and Indonesian rendang. The result was not quite what I expected, but it was still really good. 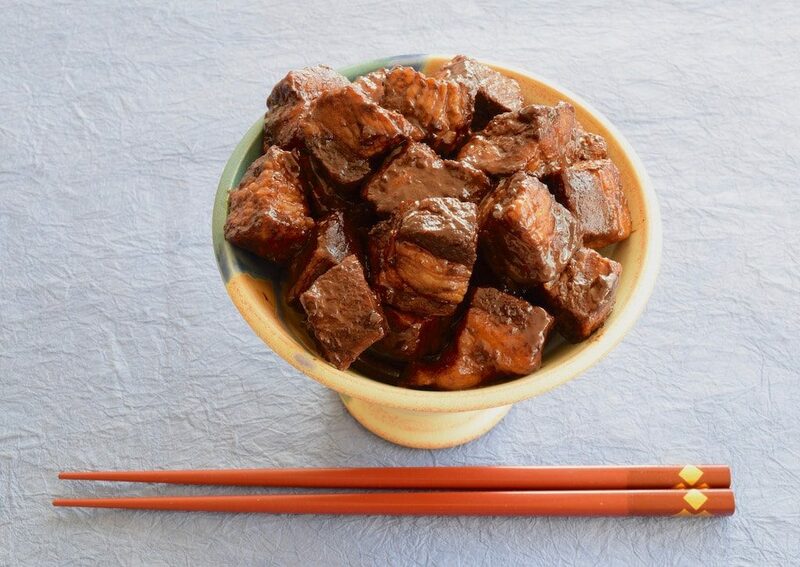 Buta-no-kakuni is cubed porkbelly slow-braised in soy-sauce and sake, while a rendang is meat braised in a coconut milk and spice paste until the liquid is simmered off, resulting in a thick, flavorful paste covering the meat. One note on this: it is much easier to first cook, then cool in the fridge, then reheat the next day. I’ll explain at the end of the cooking instructions. In general, though, making this is very similar to cooking traditional Japanese buta-no-kakuni, so I’ll start with that. 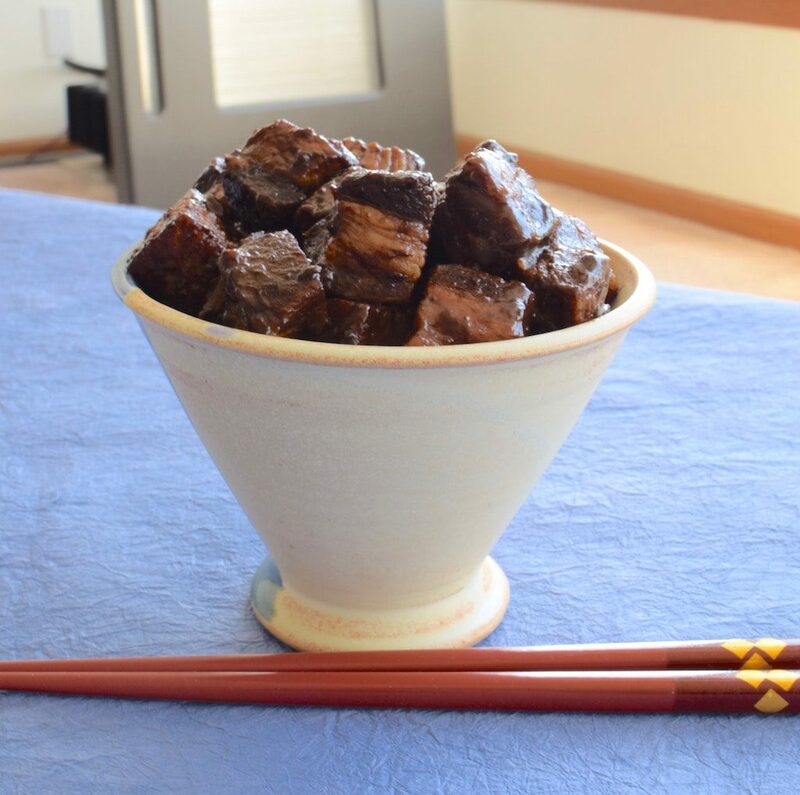 Cut the porkbelly into cubes about 1-inch square. A little bigger is OK. If there is skin on the pork belly, you can either leave it on or trim it off. 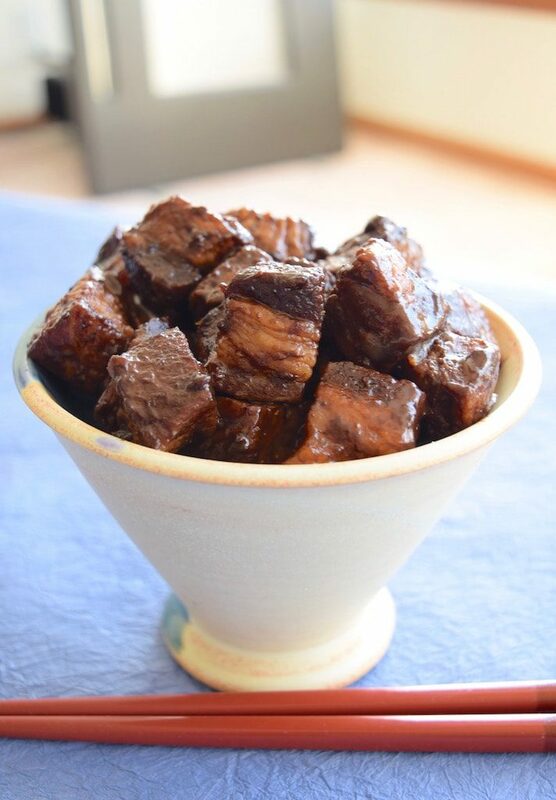 Heat a heavy pot or high-sided fry pan with a heavy bottom and brown the porkbelly cubes. For this recipe, using a nonstick pan can be an advantage. Move the meat to the edges of the pan and add the sugar. Stir a bit until caramelized, then coat the meat by stirring it in the melted sugar. Add the remaining ingredients and bring the liquid to a low simmer. Here’s where the cooking method departs from the traditional Japanese kakuni recipe. Because you’re simmering the meat uncovered, the liquid will gradually evaporate after 2-3 hours. Make sure to check on it regularly, so you don’t get caught by surprise if all the liquid is gone. Once most of the water and coconut milk is gone, you’ll see a lot of oil floating on the top of the food. This is where the two-day cooking method comes into play. Remove the meat from the pan with a slotted spoon or tongs and put it on paper-towels as a blotter. Put into a covered container and refrigerate. Next, pour what’s left of the coconut milk (it will be semi-solid) and the oil into a small container. Cover and refrigerate. After the oil has sufficiently cooled and solidified, just pull it out in one big chunk and discard. What’s left is a very flavorful thick paste of coconut milk, soy sauce and sake. heat this to pour over the re-heated pork. Serve with rice, quinoa or vegetables. Looks delicious…and happy to see Feral Cooks pop up in my inbox once again.